On Monday Dec. 12 Wayne Taylor Racing revealed its latest livery, adorning its new Cadillac DPi-V.R, prior to testing the car at Daytona International Speedway on Dec. 13–14. The car will be driven at the test and at the first two events of the 2017 IMSA WeatherTech Sportscar Championship season by WTR regulars Ricky and Jordan Taylor and Max Angelelli, along with newly retired NASCAR star Jeff Gordon. “It’s been incredibly cool to be a part of developing the new Cadillac it from the ground up,” continued his brother Jordan. “When we first went to Putnam Park for the initial shakedown test, I got to be the first driver to sit in it and take it out for its first laps. 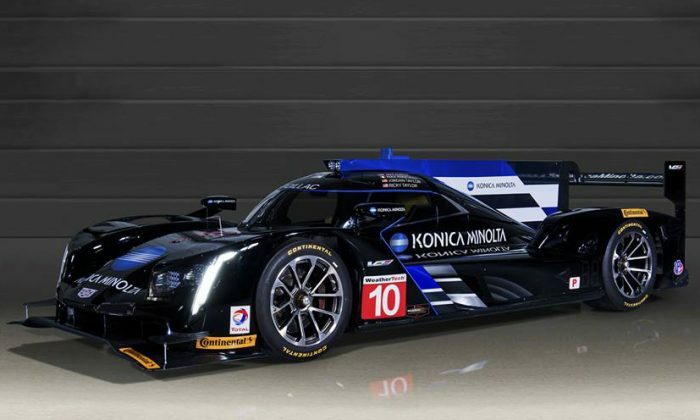 It’s been a slow, methodical process working with Cadillac, Wayne Taylor Racing, Dallara, ECR and everybody who’s had a part in the development. We picked up speed every time we tested while we worked really hard to see how the car would react to different situations. “It’s definitely a much different car than what I’m used to. The DP that we’re used to is big, it’s heavy, and it moves around a lot. The Cadillac DPi-V.R is much more aero-based, like an LMP2 car. In terms of driving style, it feels a lot different so we spent a lot of time just trying to get comfortable. It’s also been a huge effort for the team to learn how it works. Max Angelelli added, “Everything about the car is so meticulously designed and fits so well—it’s like wearing a pair of gloves that you like a lot. You can enjoy every bit of your experience behind the wheel and feel protected. That is the kind of attention to detail that went into this car. The 2017 IMSA WSC season begins with the Roar Before the Rolex 24, Jan. 6–8, 2017. The 2017 Rolex 24 at Daytona will run Jan. 28–29, 2017. Tickets for both events are available through the Daytona International Speedway website.